It’s time that you stop renewing your AAA membership. There are plenty of great, low-cost options for roadside assistance that make the yearly payout on AAA a complete waste of your family’s money. AAA is pretty much a rite of passage. A child collects their license at which time parents turn over their keys and a brand new AAA card. Parents want to ensure that their children can get access to a jump, a tow or a spare flat tire should fate strand them on the side of the road. For decades, AAA has meant piece of mind for parents handing the keys over to the next generation. What does tradition at cost at AAA? A basic annual membership is nearly $60. It covers 4 service calls, towing within 5 miles and a flat rate of $50 for a locksmith. It costs nearly $40 to cover a second driver. In other words, tradition is quite costly compared to your alternatives. Over the last several years many companies have sought to add roadside assistance to their products as a way to entice new consumers, but many of us simply never took notice. You might already have roadside coverage from many sources without knowing it. Here are some free and low-cost products that offer roadside assistance. I featured this deal a few weeks ago, but it’s worth bringing up again. American Express offers free roadside assistance to their card members. It even extends to those that have prepaid cards. The card covers towing, battery jump, tire changes and locksmith services. It all costs nothing so long as you have a card that doesn’t use periodic or membership fees. Many other card issuers offer free or low-cost roadside assistance as well. Before you are tempted to call a towing company, you might want to pop the hood of your car to take a look around. You don’t need to know anything about fixing cars to find the solution to your problem. 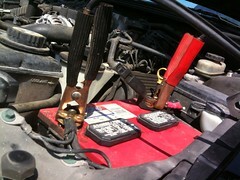 You merely need to inspect your car battery to see if free roadside assistance is offered. Some premium manufacturers, like Bosch Batteries, offer free roadside assistance. You only need to call the number on the top of you battery. Few car insurance companies offer free roadside assistance, but they charge far less than AAA. Progressive charges roughly $30 per year and GEICO charges $24. All State offers free roadside assistance to its customers. Most companies have their own plans and most of those plans offer more coverage than AAA, for less cost. Many cell providers offer roadside assistance plan and they are cheaper than AAA although not by much. For $3 to $4 each month, you can have access to roadside assistance. It may only save you $10 or $20, but it is cheaper than AAA. I’ve needed roadside assistance on many occasions. It is definitely an insurance product you want to pass on to your children, but these days there is no reason waste money on AAA. There are plenty of free and low-cost options. You only need to pick the one that makes the most sense for your family. Do you use AAA? Have you ever used an option outside of AAA? Learn how to jumpstart a battery and change a flat tire, and you’ve pretty much got nearly all of AAA’s potential help calls covered. I have used AAA (and my wife is still a member–she thinks the hotel discounts alone make it worthwhile), but I moved to an organization called the Better World Club, which promotes itself as America’s only eco-friendly auto club. BWC also has a cyclist’s plan. If these sorts of things matter to you, worth checking out. What kind of coverage does BWD have? I know that there have been a few times I could have used some roadside assistance. * Battery service: Don’t need it. Buy a battery pack, spend 15 minutes reading instructions and you’re good. * Tire change: Don’t need it. Change tire in your driveway using instructions and you’ll see it’s actually very very simple. Nothing more than a mental block the first time. Plus I check tires and spare and inflate them as necessary. * Fuel service: Don’t need it. I carry 2 2.5 gallon gas cans in remote areas. Usually they are empty and I fill ’em up only if it looks like there’s no gas. Even in the desert there’s gas stations nowadays at least once every 300 miles, usually a LOT less farther apart. * Mechanical breakdown: I drive a car < 100k miles that I service at the dealer and get everything inspected before long trips. * Lockout: Car has key code entry so not possible to be locked out. * "Who would I call?" I drive a Ford. They have roadside assistance free first 5 years and paid after that. Still, it's enough. Save your money, don't feel like you need these "services". It's your car, learn how it works, dive in, spend money on taking care of the fundamentals and you'll feel much more relaxed on the road whenever anything happens. That works great for some, not for others. I have psoriatic arthritis so changing a tire is rather difficult for me. I drive 45k miles a year to and from work and half of my commute is in a metro area. Changing a tire on a busy 4 or 5 lane in rush hour traffic is worth the cost to me. I don’t get dead batteries as I keep mine up but if I did I would rather have a reputable company come jump it that asking strangers. I would never carry gas inside my commuter vehicle due to fume inhalation dangers. One breakdown going to work could cost me more than the cost of the service just in towing. For me it serves its purpose. For others it does not. My wife has a and heart issues. There is no way she can change a tire and I am not always able to assist her. If my wife or daughter break down in 105 degree weather (it has happened) I want to know they can call and get help so read side service is a good investment in my book. Good for you. Your comment was zero help. Just bragging. It was very helpful to me, Ross. It helped me realize I don’t need AAA and saved me $75 a years. So why don’t you go back to Rachael and keep your negative comment to yourself, hmm? If my wife and daughters are stuck on the road, I don’t want them out changing tires and jumping batteries. I want them inside the locked car and safe until a vetted service provider comes to help. Roadside assistance is important in more ways than we imagine. I remember my parents using AAA to get maps with highlighted routes to me across the country for the navy. I imagine it was worth it back then before GPS but I agree they have become obsolete. Usaa offers roadside assistance and it is either cheap or free, I can’t remember which. I have mine through my insurance….but I totally use my mom’s AAA card to get hotel discounts. We still do subscribe, and I do think it’s worth it depending on the family members involved. That being said, you bring up some interesting points. In particular, I did not know that some cell providers offer roadside assistance. Might have to look into this one a bit more! Glad I could point out a new potential opportunity. My mom is the only one in the family with AAA. She also uses the free maps as wrapping paper! That is the coolest sounding wrapping paper ever! I’m going to play a little devil’s advocate here. I locked my keys in the car 3 times within a couple months 2 years back. Aside from the fact that I’m dumb, I called AAA every time and they were there within 10 minutes every time. Since they contract out to local shops around the country they have a presence very close to almost anywhere you’ll be. I actually have an AMEX gold card but I’ve only needed a jump once and I knew that if I called AAA they’d be there within 10 minutes(which they were), not sure how long amex would take. Has anyone tried it? I would hope that it is good, since it’s a big part of marketing their member services, but I haven’t tried it yet. I did get a card and will be using it for the next roadside adventure that I have. I’ll be sure to report back. I know this is an old thread but for those reading. Sprint decommissioned there roadside in 2012. T mobile doesn’t offer one. Verizon’s is $3 per line per month. Which is for 2 lines as much as paying for AAA. basically I will stick with what has worked for years. One more thing my Credit card company also will charge me a rate, forgot how much while writing this but if I need service they just connect me to the nearest AAA. I DID have AAA and needed it for a dead battery traveling hundreds of miles from home at night with my two young children. I called AAA for help and the rep told me I wasn’t covered as I didn’t make my payment so they didn’t lift a finger. I broke down in tears feeling as though I had let my family down for my oversight. When I returned from our trip a AAA renewal notice was in the mail. Curious I called and relayed my experience and asked why they were sending me a renewal notice. AAA confirmed I was current and had not missed a payment. I will NEVER forgive their oversight! 8/10/16 – 2-1/4 hour wait for a AAA tow in Irvine, CA. AAA told me 40 minute wait, no calls or updates from AAA after 6 phone calls to them asking for an update, The last call I made said they sent me a text message that I didn’t receive – she repeated this over and over and over again until I hung up … Truly irritating to have someone repeat to me that their records show I didn’t receive an update after a 2-1/4 hour wait if broken tow times … This is why I’m researching a new plan. And came across this post. July & August 2016 – 2-1/4 hour wait for a AAA tow in Portland, OR and Vancouver, WA. AAA told me 40-60 minute wait, no calls or updates from AAA after 5 phone calls asking for an update. Both incidents were very frustrating and the one in Portland, OR was in 100 degree weather where we were stuck on the side of the interstate for over two hours with no water. Each call they told me a different story, none of which was true (as confirmed by their manager I finally got on the phone) This is why I’m researching a new plan. And came across this post. AAA tells me up to 40 minutes. Five hours later (long after my tank is sucked dry, no exaggeration, just nuts), the locksmith pulls up like a rockstar and I’m in my car within minutes. In all my AAA experiences, their guys are always polite and technically skilled. But the whole day invariably becomes a write-off. BOTTOM LINE- Unless you’re really gonna use the perks, discounts, benefits, etc that comes with the service (I do), there’s better alternatives. You failed to mention some extremely important factors that you may not have known yourself, such as triple will tow you home. No other tow service will do that they will leave you with your car. Secondly all aaa drivers are background certified, while as insurance and cell phone providers sell your information to third parties because there is no geico tow trucks or all state. They are contacted to the closest towing service. Did you know insurances such as geico offer tow service but note up to 100 dollars in towing, do you even know how far a 100 dollar tow is? Your talking about 20 miles when you could of paid 83 dollars for a plus service that covers 4 service calls for 100 miles. No other company covers you as a member so you can be in anyone else’s vehicle and you are covered! You should really do your research before blasting a reputable business that’s been around before most of you were born and all these other companies have tried to replicate. You get what you pay for! If you buy your son coverage that will pick him up stranded than still leave him stranded because you saved 20 dollars! Way to go you! My mother passed away October 27, 2016. My car was in the shop when I got the call at 6am. I decided to take my motorcycle to the hospital to be with her and meet up with family members. I had to stop for gas and my motorcycle would not start up. I called AAA and they told me a truck was on the way that can tow my bike. About an hour later I called to find out where the tow truck was for my motorcycle and they checked and said it was about 10 minutes away. BUT they informed me that they sent the wrong truck it cant tow a motorcycle. So they cancelled it and called out for a new flatbed truck. Instead of sending the driver to see if they could jumpstart my bike they CANCELLED IT!!! I kept calling every 30 minutes for updates (yes, they were well aware of my mothers passing) This nightmare lasted about 3.5 hours before I was finally on my way. Guess what the driver jump started my bike…………………..GO FIGURE!!!!!!!!!!!!!!!! They never apologized, I never received a call from management to check on the situation, this year would be my 23 YEAR AS A MEMBER. This is how you get treated as a customer with longevity, NOT IN MY BOOK! This happened last year and now my membership is up for renewal roughly $237.00 for PLUS family coverage. I called to see if they could have some kind of discount for the issues I had back in October. The person apologized for what happened, but said no to any kind of discount, he did offer to cancel my membership, and did not even try to do anything to keep me as a customer, 22 YEARS of paying for peace of mind and when you really need it, it was not there! After receiving my 3rd renewal notice for just over $200 fo one year for my wife and I from AAA, and getting a phone call from them as well, I too decided to research alternatives. One thing that is true from your initial post, getting a AAA card is truly a rite of passage and there were a few years when the benefits paid for themselves, especially the year we went to Disney World through AAA Travel and rode the Auto Train down there. The last few years we have used them less and less so the benefits come nowhere near the increasing cost anymore. However, many of these vendors offer AARP discounts which membership cost a lot less. This segues to my next point which is that some Citicard plans offer a pay-per-use roadside assistance plan. AARP, besides offering many of the same hotel and travel discounts as AAA has a 24/7 roadside assistance plan as well. If you lease your vehicle I believe roadside assistance comes with some of the leases. There are other options and your post helped to open my eyes and look for them. I have been a member for close to 30 years. I called May 1st, 2017 at 7:00 pm for a flat tire and after 30 minutes, I called my son to bring me a maul and piece of wood. After another 60 minutes, I got the tire off. My wife was on the phone for the 90 minutes and no one even picked up to talk to her. She hung up a few times in that 90 minutes. I called AAA a couple days later and they told me that I should have known the AAA garage which was closed and that I should have called the garage directly. They were rude to me. I just called AAA to put my son on for AAA for 4 months and it was $55. I am going to try and call AT&T to put him on that . After my renewal in Feb 2018, I am done with AAA. They serve a purpose but why should I pay out $200 to get spoken to rudely, get no one to pick up after 90 minutes and I have to change my own tire by first trying to kick the rim off then hitting it with a maul. I am 57 years old and I am done with them. At least, I got the tire off which a lot of people could not do. After 22 years membership with AAA I am done renewing. Unfortunately my new plan starts tomorrow, and I will have been a 23 year member a year from today. I called for a tow truck today to take my pickup to my mechanic . My tag was expired and I couldn’t find my new one. I rarely take this truck off my acreage, but was hauling metal to the dump today. The driver said he could haul to a business but not a residence due to tag. I said it is a business and have had several vehicles hauled there. But he said there is no business sign in front of property and dispatch can’t find on google. He told them to check records for previous trips there. Still they refused. After driver left I called AAA and told my story, and she called dispatch and they lied to her and said it was only due to tag. Never admitted to her they could have towed to a business. She had looked my records and saw where I had vehicles towed there before for repair. I had offered the driver to let me go to business and bring out official receipts and business cards with the address on them. At any rate I am done with AAA. I had to call for a jump about ten days ago. Another five days later. Then a third time and last. Towcompany called me back said the local statefarm co. said I just used the service so I was not covered. I called the 800 number asked if that was true. No it was not they sent a tow truck to jump me. So the local statefarm was going to leave me stuck. We were Triple AAA members since 1967. Today, I called them because a part on my car disintegrated in the road and the transmission refused to go into any gear. AAA said they would have someone there within the hour. No one showed up. After calling them back, they then told me they would have someone there in 20 more minutes. No one showed up. I received a few calls indicating that someone would be on their way. I waited, and waited. No one ever showed up. I have the Premier membership too. Finally, I ended up calling a towing firm in the area and they were there within 30 minutes. No hassle. I did spend $80.00 but, it was worth it because I was out in the heat and I have heart problems so, I figured it was a great deal. I called 3 times to complain to AAA but, in each case, they refused to let me speak to a supervisor. They never offered to reimburse me for the tow truck either. They acted like they didn’t care at all. Needless to write, I won’t be renewing next year. I have my life insurance through them and I am cancelling that out too.